The regular meeting of YTMC was held for the first time in about a month. Today, the speech marathon was planned. So there were 7 speakers in this meeting! 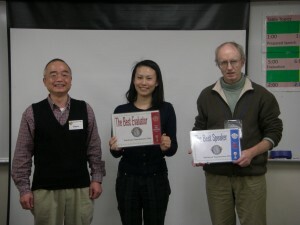 Speakers gave audiences prepared speech using each speech skill. Then many speakers gave speeches using PC. But unfortunately, a projector and some of their PC were not compatible. If we use the device like PC in the speech, we need to deal with the possibility of an accident. And if we can do nothing about this, we give the speech without PC!! But I’m sure YTMC members can do it! 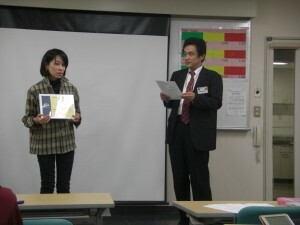 Dec.15th is the last meeting in 2012. We will plan year end party. YTMC was chosen for President’s Distinguished Club!